This yoga trek takes you to the Basecamp of Mount Everest, without doubt the most iconic among the Himalayan giants and a symbol of challenge and perseverance among adventurers everywhere. It has a duration of 12 days. A classic among the Himalayan treks, this trek offers you ample adventure and stunning views. Starting among picturesque mountains and forests which are inhabited by a wide range of animal and bird species, we discover the unique culture of the Sherpa communities who welcome us to their villages as we move up the valley towards Mount Everest, known as the abode of the Gods. Following in the footsteps of legends, we climb from Lukla to the vast glaciers and razor-sharp ridgelines of the Everest Himalayas, home of the world’s highest peaks. At Everest Base Camp, we stand face-to-face with the fabled Khumbu Ice Fall and its towering seracs. We hike to the summit of Kala Pattar at (5,545m) for a uniquely unobstructed 360 degree view of iconic Mount Everest and the other giants surrounding it, such as Lhotse, Nuptse, Thamserku, AmaDablam, Pumori, to only name a few, before making our way back to Lukla. This trek equally offers the opportunity to visit the old Buddhist monasteries of Thame and Thengboche, this region’s largest monasteries. Due to the high altitude of this trek, yoga and meditation classes are offered only during the lower-lying parts of the journey. At high altitude, we do not usually have the energy for yoga, and sleeping during the day is discouraged for health reasons, so we skip both the yoga and the meditation/relaxation for 3-4 days while we are close to Everest Basecamp. Early morning flight to Lukla. The Kathmandu-Lukla route is one of the most dramatic, and most beautiful short flights in the world. A prominent mountainous landscape, and fresh mountain air greet us in Lukla. We meet our porter(s) and start our trek through the village of Lukla until we reach Phakding. Today’s relatively short hike favours acclimatization. We trek up the gradual valley trail, through several villages, and across rivers and mountain streams. We have lunch at the village Monjo, the entry point to the Sagarmatha National Park, which we enter after lunch. Trekking through the Sagarmatha National Park with its alpine forest, varied plants, birds and trees, and mountain streams is a pleasure. We finally reach Namche Bazaar, the commercial hub of the Khumbu region, with splendid views of the mountains Thamserku and Kongdi Ri Himal. Today, we stay in and around Namche Bazaar in order to acclimatize. We hike to the Everest View Hotel, the highest located hotel in the world, with spectacular views of Mount Everest and many other Himalayan Peaks. Back in Namche Bazaar, it is easy to pass an afternoon: The town has an Everest Photo Gallery, the Sherpa Culture Museum, as well as Internet cafes, shops, restaurants, and a bakery, as well as a colorful market some weekends. Overnight at a tea- or guesthouse. An easy trail along the Dudh Koshi River, through settlements and rhododendron forests, during which we experience beautiful views of the Mount Everest, Lhotse, Nuptse, Ama Dablam and many other magnificent Himalayan peaks. Once arrived in Tengboche, we visit its famous monastery, which is regarded at the spiritual center of the Khumbu region. We cross the Imja Khola River via a suspension bridge and continue our trek along the river. Along the way, we pass the village of Pangboche, from where views onto Mount Ama Dablam are spectacular. Following the Imja Khola, we pass by small villages. 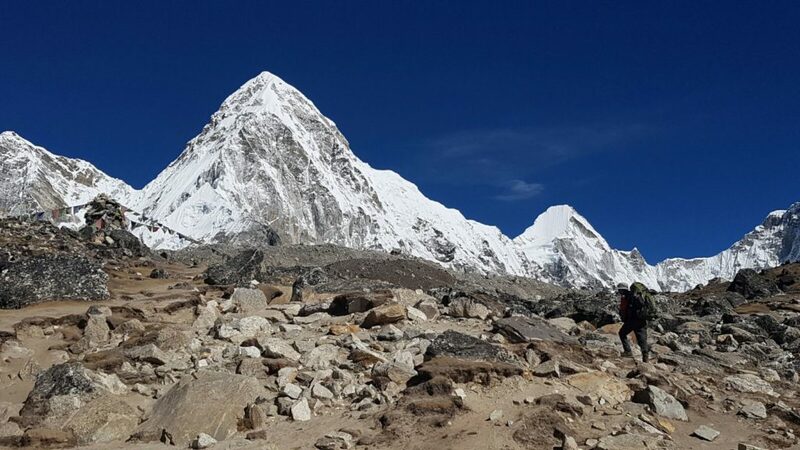 Dingboche is called the “Summer Valley” of the Khumbu and contains a kilometer long wall to protect the village’s crops from the cold winds which descend down the Imja Valley. The steepest climb of the day is reserved for the end, and takes us up to Dingboche, from where we see more spectacular views of Lhotse, Ama Dablam and the Island Peak. For those who would like, today’s day hike to Nagarjun rewards us with a magnificent panoramic view of Lobuche East (6119m), Lobuche West (6145m), Kangtega (6685m), Taboche Peak (6367m), Thamserku (6608m), and the Ama Dablam (6856m). On a clear day, Mount Makalu, the world’s fifth-highest peak can be seen. Upon return to Dingboche, we have lunch and relax at the sunny village. As we make our way to Dhungla, we come across the Trekkers Aid Post- situated at Pheriche. It is run by the Western Volunteer Doctors and assisted by The Himalayan Rescue Association. The aid post helps in the treatment of trekkers. Climbing up further, we reach the moraine of the Khumbu Glacier from where we have a beautiful panoramic view of the peaks on the Nepal-Tibet border, including Khumbutse, the Mahalangur Himal, Lingtren and the Pumori. We follow the valley to Lobuche, a tiny settlement with a few teahouses. Overnight at a tea house. A highly anticipated day: we leave early and walk alongside the highest glacier in the world, Khumbu Glacier, passing through Gorak Shep, a tiny settlement with some lodges, and finally reach the legendary Everest Basecamp. From here we have spectacular views on the surrounding peaks and see the Khumbu Icefall. After spending some time at Everest Basecamp, we descend to Gorak Shep. We leave before sunrise, and climb up to Kala Pattar for the highest viewpoint on this trek, with stunning 360° views, for a spectacular sunrise. We descend into the Pheriche valley, past Gorak shep, and walk down to Pheriche. Along the way, we have spectacular views of Ama Dablam. Overnight in a tea house. Our trail follows the Imja Khola River through an alpine meadow landscape with superb views, through rhododendron forests, toward Phungki Thanka, and past Kyangjuma, experiencing village life. This is a relatively easy and relaxing hike. Descending to the Imja Khola river, we walk through the peaceful rhododendron forests, to the village of Devoche and then Tengboche. Overnight in a tea or guest house. Our trail descends steeply and we pass chortens, prayer flags, mani-stone walls and small Gompas. The setting is again open plains, pine and rhododendron forests and snow-covered peaks, and the Dudh Koshi river rushing by. Once in Lukla, we relax. Overnight at tea or guest house. A spectacular early morning flight takes us back to Kathmandu. Your day is spent at leisure in Kathmandu. Overnight at a good standard hotel in Kathmandu. NOTE: Occasionally flights between Kathmandu-Lukla and vice-versa are cancelled due to bad weather. If the flight to Lukla on Day 1 is cancelled, we will start the trek with a delay. Similarly, if the flight to Kathmandu on Day 12 is cancelled, we return with a delay. It is good to ensure you have a few buffer days at the end of the trek to allow for such delays which cannot be foreseen. Our program ends on day 12 of the itinerary however our staff will look after you until you get back to Kathmandu. In case of delays past Day 12 of the itinerary, any extra costs for accommodation and food will need to be covered by the guest.